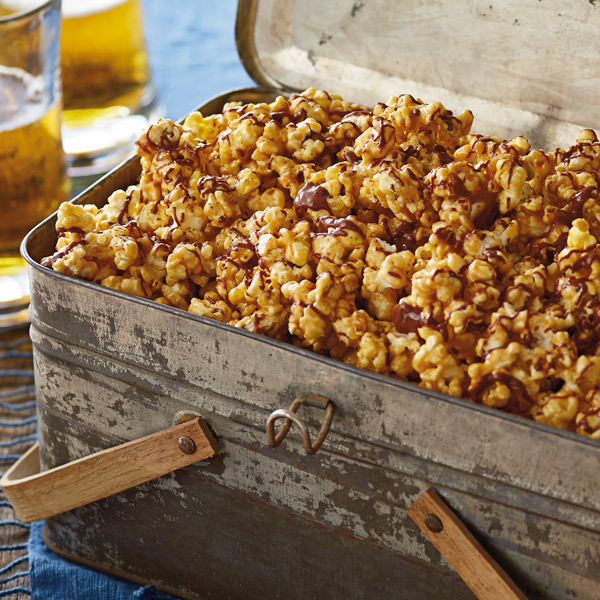 Made with peanut butter, milk chocolate chips and a dash of cayenne pepper, this sweet-and-spicy popcorn mix is salty, crunchy and more than a little addictive. To make our easy Spicy Chocolate Peanut Butter Popcorn recipe, first drizzle on a layer of spiced-up peanut butter syrup, and then finish with a drizzle of creamy, melted chocolate chips. In just a few minutes, you can create a delicious chocolate-covered popcorn snack that wakes up your taste buds. In microwave, melt sugar and corn syrup, stirring every 30 seconds and watching carefully to prevent burning. Stir in the peanut butter and microwave again, stirring every 30 seconds or until peanut butter melts and mixture can be blended evenly. Remove from microwave; add vanilla and cayenne pepper to taste. Drizzle mixture over popcorn, stirring to distribute evenly. Spread popcorn on a cookie sheet to cool. Heat the milk chocolate chips and shortening or vegetable oil in microwave for 30 seconds, stirring and microwaving an additional 30 seconds if necessary, until melted. Drizzle chocolate over the peanut butter popcorn with a spoon. Allow chocolate to harden. Then break up the larger chunks of popcorn and store in an airtight container until ready to serve.